Agnes just gave us a nice primer on mud. But what happens next to make mud into a rock? First, we need to answer the question, What’s a rock? This is a simple question, but it’s tricky to tie down a simple AND satisfying answer. Most of the geologists I asked on board said, “A rock is a solid aggregate of minerals.” That’s what a textbook says, but others disagree with the boundaries of this definition. What about coal? That’s not made of minerals. What about our bones? They’re not rocks. – all of one composition or a mixture of different compositions. This seems to work for our purposes of what’s rock and what’s not yet a rock. Note that some rocks do break apart easily. Shale by definition breaks into sheet-like layers. But it’s still a coherent mass of mineral grains that doesn’t just fall apart in your hands. The sediments we’re looking at are well on their way to fitting this definition: they’re naturally occurring, the individual grains or minerals or fossils are hard (though the combination of them is not yet hard), they’re individually solid, and they’re not made just by one organism. There are lots of different minerals, so in this case the rocks that our sediments will turn into are polycrystalline and a mixture of different compositions. Some rocks are made of just one mineral, like quartzite (quartz) or limestone (calcite). When sediments settle to the seafloor, they form a layer of particles, whether they’re grains of sand, silt, and clay from land or tiny micro-organisms that lived in the ocean. 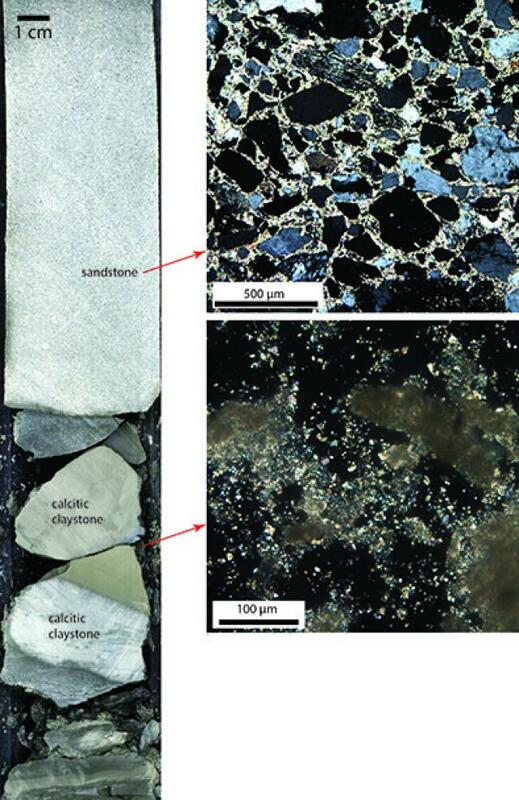 Sediments are already made of the right stuff, but they might not yet be rocks. 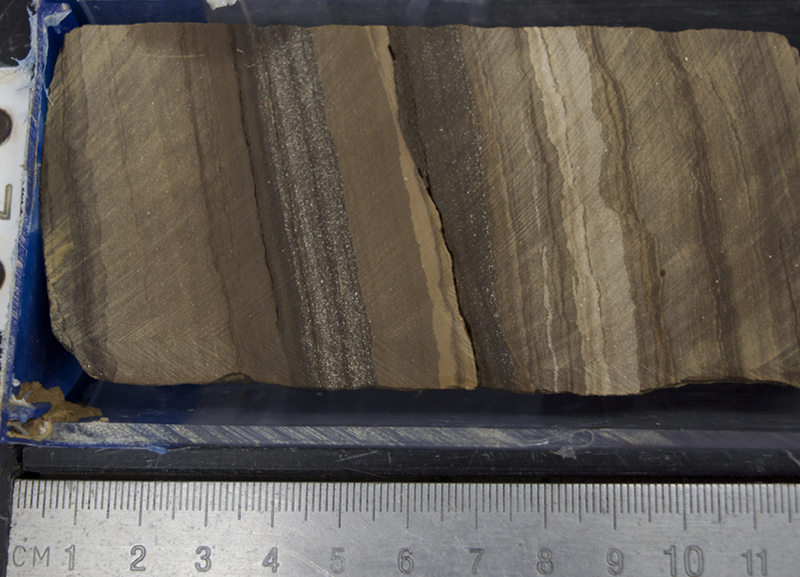 The young sediments in the upper kilometer or so of seafloor that we drilled through were not yet rocks. For the first few hundred meters of the holes at Site U1480, the sediments were soft and easily disaggregated. That is, we could easily take a tiny toothpick scoop of sand or mud and smear it around on a smear slide, as Agnes explained in a recent blog post. What exactly the sediments are made of determines how quickly they’ll become a true rock. Carbonate minerals eventually make up rocks like limestone. They’re reactive and can quickly turn into rock. If you go to the beach in the Caribbean, where there are high concentrations of carbonate minerals in the seawater, you can see rocks forming over a time period of years. It can take millions or even tens of millions of years for sand and mud to turn to rock. This process of becoming a rock can be sped up if there’s carbonate-rich water flowing between the grains of sand and mud or carbonate grains (shell fragments, calcareous algae flakes, etc.). The calcium, carbon, oxygen, and other atoms that make up carbonate minerals dissolved in the water can then grow together as carbonate minerals between grains of sediment and glue them together. This is called cementation. Carbonate minerals can also glue non-carbonate chunks together. We found a layer of proper sandstone in one of our cores, with carbonate minerals cementing the sand grains together. The image shows a core section scan with close-up photos taken with a microscope, looking through a very thin slice of the rock glued to a glass slide. There were layers of unconsolidated sand above and below that were not yet sandstone because the grains weren’t cemented together. We interpret that this rock layer must have been a place where underground water could flow because sand is very porous and permeable, meaning water can easily flow through it. The water was rich in carbonate ingredients, so carbonate minerals were able to glue the grains of sand together. Other kinds of cement are silica and iron oxide. 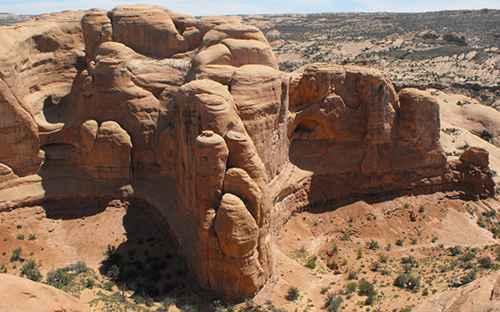 The iconic red sandstones of the American Southwest owe their color to iron oxide cement. The grains of sand that comprise them are actually mostly colorless quartz! In addition to cementation, compaction also helps turn loose sediments into rocks. As sediments get buried by more sediments and water above, they “feel” more and more pressure. Even just 4200 m of water, where we are now, provides 400 times as much pressure as the atmosphere exerts on us. At 1000 mbsf, there’s an additional 200 times atmospheric pressure just from the overlying sediments. We could very clearly see the difference between young, uncompacted sediments at the top of the hole and much older (more than 60 million years older!) compacted sediments and true sedimentary rocks near the base of the hole. Here are some photos for comparison. 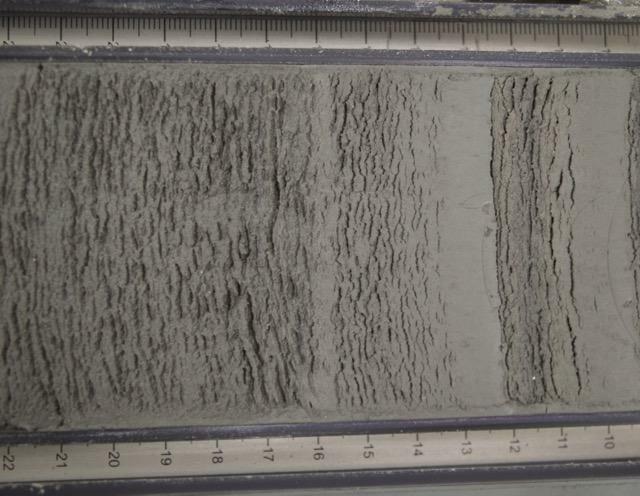 The first is some silty, clayey land-derived sediment very characteristic of the mid-shallow subsurface of the ocean. There are of course other ways of making rocks, but we’ll leave igneous and metamorphic rocks for another time.